Are you looking for a great brand of nappies and baby wipes? Great price and good quality? Since Maxwell was tiny we have always used disposable nappies. I have always been wary of using supermarket brands as I normally like to use the more talked about big brands such as Huggies and Pampers. When Aldi asked Me and Maxwell if we would like to try their range of Mamia Ultra-Dry disposable nappies I was excited to see what they were like. When the nappies arrived my first thought was that they seemed quite thin and had a different texture that felt a bit silky on the outside of the nappy, apart from that they looked good. The nappies had a cute animal motif design on which I really liked. Over a period of a few days Maxwell tried the nappies, not only in the day but also at night time and we found the nappies to be very good. I found the Aldi nappies to be very absorbent and found they fitted well. They coped well with Maxwell running, walking, playing, everything a toddler likes to get up to in the day. In the past Maxwell has had accidents in the night with other brands which have ended up making him disturbed at night and also giving him a rash, however these nappies left Maxwell dry and let him have a good nights sleep. I was pleased to see they did not irritate his skin or even leave him with marks. The nappies are priced well and really are a bargain. 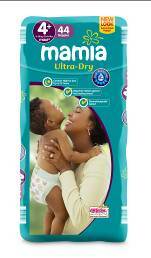 We were sent a pack of 44 Mamia Ultra-Dry 4+ which are priced at just £4.49. Maxwell is always getting messy. He is a typical toddler that loves to explore. From chocolate around his face to dirty hands after his dinner we are always on the hunt for some baby wipes. Not only are wipes useful for messy hands they are great for bottoms. We were sent some wipes to try from Aldi and were very impressed. They are a great quality and they had the right degree of wetness. They were thick and did the job they needed to do. When changing Maxwell's nappy I normally struggle to get wipes out but these were easy to get out of there packet and came out one by one instead of clumps. I thought I would try the wipes on me to get a parents view. I used them to clean the make up off my face and again I found they were fantastic. They felt soft on my skin and left my skin feeling clean. In my eyes they are just as good as the bigger brands and are fantastic value for money. We were sent 2 packs of wipes. One pack being fragrance free and the other being fragranced. I found the frangranced ones smelt very nice. They did not have a strong smell. Mamia baby wipes are designed for baby's sensitive skin.They retail at 79p which is very cheap for such a great quality of wipe. I have no negatives to report back about these baby wipes. I found that they were great. Overall I would rate the Aldis Mamia range of nappies and wipes 5/5. I am no longer a brand snob and have realised that supermarket brands are just a good. To find out more about Aldi's range of baby products Follow Aldi on Twitter and Like Aldi on Facebook. I tried most brand of nappies and found that the Aldi ones were best by far, they never ever leaked, they fit really well and I thought the designs were lovely. I found them to be even better than the leading nappy brands and would certainly use them again if I had another baby. I really wish more mums knew about this brand because the price and quality is amazing.... no I don't work for Aldi, I was just very impressed with these products! i've haven't tried yet but they seem to get good reviews so will give them a go. i love the wet wipes and nappies from aldi's! but the nappies arent good enough for my youngest because she leaks through! I prefer Aldi wipes over any others I've used. Try it. Price doesn't compromise on quality. I prefer them over Huggies and Pampers. They're way better and cheaper. For nappies I prefer to use Asda ones. Tried Aldi and big name brands but Asda ones were the best for my baby.